The eDab Fantom Cartridges are the same advanced heating attachments that are included with the eDab Fantom Battery, designed for use with essential oils. 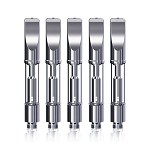 They sport a quality stainless steel construction with true Pyrex glass tank section that is durable and designed to hold up to 0.5mL of your favorite concentrates. eDab engineers the Fantom Cartridge with an advanced cup style structure that is both easy to fill and leak-resistant. All you have to do is unscrew the center post, carefully fill in your material up to the max fill line, replace the post and your ready to go in seconds with absolutely no waste to clean up. Internally you have four 1.5mm wicking ports that lead into the cutting-edge wickless ceramic heating element. The extra wide inlets will help to keep the ceramic constantly saturated while also allowing for use with a wider range of concentrates. The Fantom Replacement Cartridge also features a top adjustable airflow control valve that turns in either direction for greater control over your vapor quality. There are three air inlets that can be covered or exposed to increase/decrease vapor production to fit your liking. eDab's Fantom Cartridge measures in at 11.2mm in diameter and has a near universal 510 threaded connection, making it compatible with most 510 mods and batteries on the market. 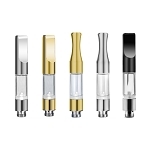 Invest in eDab's Fantom Wickless Ceramic Oil Cartridges today in your choice of Stainless, Gunmetal, or the sleek new Matte Black color option, each individually packaged in plastic tubes with top and bottom dust covers. eDab Cartridge Refill Kit: Include above at a discounted price and receive a medical grade filling tool with interchangeable tips to cover all of your filling needs without the mess. These carts are great: They are by far the easiest to fill up, with no mess whatsoever. All of the carts came in perfect working condition, and were carefully packaged to avoid damage en route. And as usual with NextDayVapes I received my order in expedited fashion.